we need this. else we will loss everything. A very great event. I would also humbly suggest to our Hindu Sadhus and saints and leadership to organize pure RAM mantra chanting. Our hindu scriptures extoll the RAM mantra. Everyone of them says that RAM mantra not only protects it resolves problems. Pure RAM mantra. Chant RAM together in a group. Chant RAM with one RAM in one breath. Do this together for 10-15 minutes. Then chant 2 RAMs in one breath for 10-15 mins. Then chant 4 RAMs in one breath for 10-15 mins. Send the RAM mantra to the temple. Let the RAM mantra clear the obstacles. I wrote and article on the RAM mantra and also the youtube video on how to chant it. I urge all the Hindus to try and and feel how it helps us against the Muslim infractions. We Hindus need to unite against the Muslim terrorists. NARENDRA MODI IS OUR NEXT PRIME MINISTER AND UNDER HIM INDIA WILL BE TRANSFORMED INTO SUPER POWER. PLEASE VISIT THE LINK GIVEN BELOW AND READ ALL THE ARTICLES WHICH EXPOSES THE PEOPLE WHO WANT TO DESTROY BJP , HINDUISM AND ULTIMATELY INDIA. 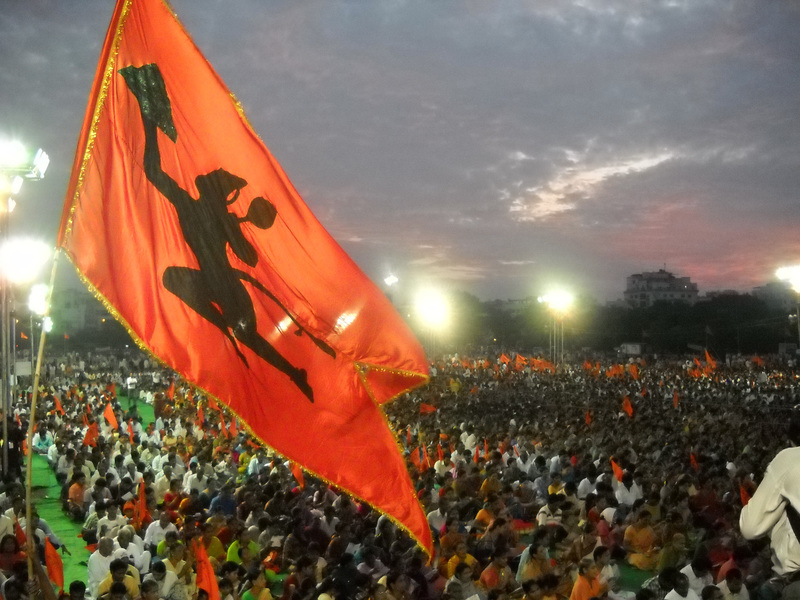 It was a commendable program… Still many people are unaware of the issue… Every Hindu must be educated about the injustice done to them in their very own country….. Hope the dream of “BHAVYA RAM MANDIR” will be realised soon…..
RAM LAKSHMAN JAAN KI JAI BOLO HANUMAN KI..
Let me very humbly tell you as regards the Struggle for India’s Independence the contribution of Muslims is not negligible but negative.The Secular Historians in collusion with the Congress Government in power have changed History and singing the glory of Muslim Contribution. And many Muslim writers of History have added Fictions to it. Because it is the Congress under Nehru which banned the Hindu Communities like Hindu Mahasabha and RSS falsly implicating them for Gandhiji’s murder , and what is more Nehru embraced the Muslim League justifying that Muslim league is different from the earlier Muslim League which demanded and wrested Pakistan.Since there is no scope for writing much at length let me quote from the so called Nationalist Muslim Maulana Azad’s INDIA WINS FREEDOM.Orient Longman 1988 Edition Page-246 “Pakistan was the creation of the Muslim League….I have already described how the Muslim League was originally founded to oppose the Congress.the League therefore had hardly any members who had fought for the independence of the country .They had neither made any sacrifice nor gone through the disciline of a struggle…”Hence the Muslim view after 15th August 1947, is aptly capsuled in the slogan “Haske Liya Pakistan, Ghuske Lenge Hindusthan” . And towards this declared goal they are steadily yet swiftly moving in a strategically planned manner .The unprincipled Vote-bhikaries do not bother. ; the slavish Hindu nation suffers from paralysis under an overdose of Secular-opium .God ave the Hindu! We all agree to what you said now this going to far we don’t want to be refuge in our own country and I personally feel that instead we should stop this at any cost this country belongs to us Hindu and it is not a property any political party. And sir i sincerely warn this people that Hinduism is a very tolerant religion i think that is getting over and god forbid we are not aware of the reaction and my only request with all the Hindus please we should not lay low now being minority community when some can get so much of think age and political mileage why not we being majority. We have to vote out the political party who not protecting Hindu. We should also unite as Hindus not as regional Hindus And remember as we have one planet we also have one country. Very inspiring. My suggestion is to chant the RAM mantra by itself. RAM mantra is the most powerful mantra. I have written a short explaination at this blog. If 500 people chant it together.. Just RAAAAMMMMM, then it will have a very powerful positive effect. Also pray that RAM bhoomi should become Hindu land, during chanting and pray for a large Temple built there. It will happen for certain. This week I will post how to chant in Youtube for every one. It was simply superb, as I too took part in the Shree Lord Hanuman Jagran it was a great feeling. It was very apt to say that seeing is believing. We must unite sinking our caste and creed. Hindus should stop suffixing caste after the names like Reddy, Naidu, Pillai, Nayar shetty, etc. Hum bhakt balaji ke aur Bala bhakt Ram ji ke …. siya ram ki jai bolo aur karya aarambh karo …. hindu yuva shakti manch ko sambodit kerne ka pryas avashya hi rang laayega, per rang santri tabhi pakka hoga jab kesar milega saath. It was a fantastic event, I really go by Dr Gour Mohanty views that if we do not act as fast as we can then the time will not be far again Indians will be there own slaves. for the independence of our country Hindus And Muslims and many people from other religion had struggled but the reward was only given to Muslims By the country and then British rulers and that reward was Pakistan . Muslims have been rewarded for the effort they have made for freedom of Bharath. Our country and again they cannot demand more they have to live In this country as Indians and with our law and with no special treatment if they minority comunity that was their choice it was not ours. If that is exploited that is because of politicians that is of no fault of Hindus of this country This country belongs to Us and only for Indians and there is no Minority Or Majority that is all equal people should under stand the political games played by our politicians or Else this will be a major setback for the people I demand from all Hindus of this country weather they live in India or any country Join hand and strengthen our nations which belongs to us.HINDUS AND INDIANS. SUperb… Program… We will do more programs….. I feel happy and proud that you have boldly overcome the resistance posed by the police and the administration.We surely cannot ignore the fact that now with 7 MLAs of the so called Minority community they have the upper hand.In September at Deganga of 24 Paragana only 60 kms from Kolkata one Muslim Trinamul MP created havoc and made life miserable for the entire Hindu community .We have the bigger task of infusing the pround Hindu feeling and sentiment among the Officers in the Police and the Administration , so that they do not behave nor act as slaves of the Minority .These shameless creatures are responsible for Muslim-Raj in eighty percent Hindu India where Hindus like Kashmiri Pundits become refugees in their own country! Shame Shame Hyd police. JAI SHRIRAM.MANDIR BHAYVA BANEGA……. WAHI BANEGA………….. 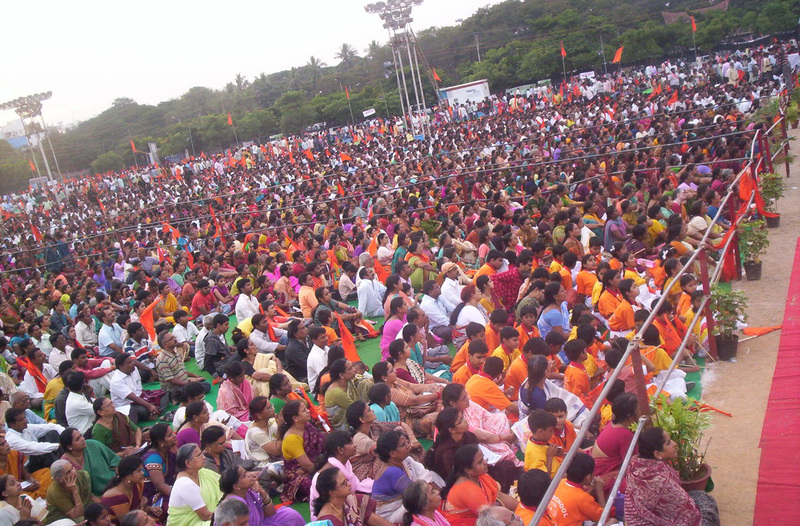 I was there and delighted to see such a huge gathering of Hindus. The author has brought about a Historical aspect of this grand event, which is to be reckoned, as a good unique identification. It was amusing to see a newsitem “HC permits mass recitation of Hanuman chalisa” after being denied permission by Police commissioner citing that the situation is tense after the post Ayodhya verdict. Its unfortunate that a petitioner had to approach the High court to arbitrate in the matters of purely religious concern after denied permission. How the recitation of Hanuman chalisa destroy the peace and tranquility is the moot question? Will the Commissioner be bold enough to similiarly deny permission at the Idgah for a religious gathering? Should Post -Ayodhya verdict tensions be a yardstick to prevent a particular religous denominations and how long? Is it perpetual,infinite ,ageless and endless ? If I may make a suggestion. It is Sitamma whose blessings you need to build a temple in in Ayodhya.